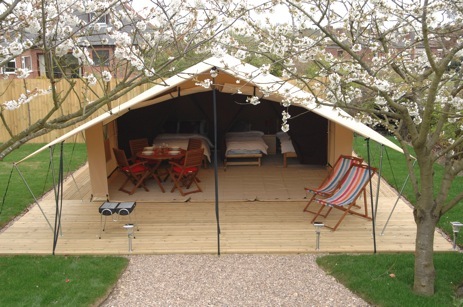 Enjoy nature walks, cycle trails and the Peak District from Teversal Campsite Glamping in Nottinghamshire. 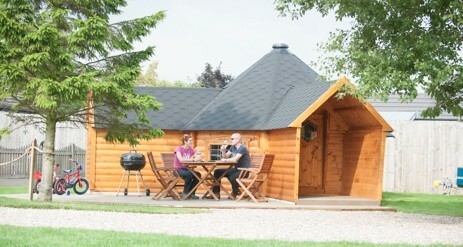 Our award-winning Club campsite at Teversal is surrounded by gloriously varied walking country. Opposite, the Silverhill Wood Country Park offers direct access to the Teversal Trails and miles of walking and cycling paths. Further afield the walking and cycling trails of the Derbyshire Dales and Peak District offer more challenges through ever changing scenery. Hedges and greenery pepper the site which boasts fantastic amenities: auto sensor power showers, individual washrooms with shower, toilet and sink, parent and child facilities, a well-equipped laundry and washing up area and children’s play area. The shop is well stocked and morning papers are available. There’s even a dog/bike shower and bike hire is available too. 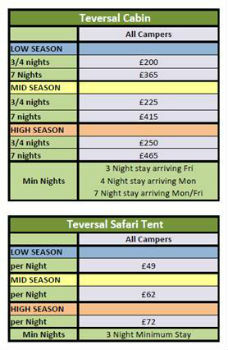 Escape the urban jungle and enjoy a Club Glamping experience in Teversal Club Site’s magnificent Safari Tent. 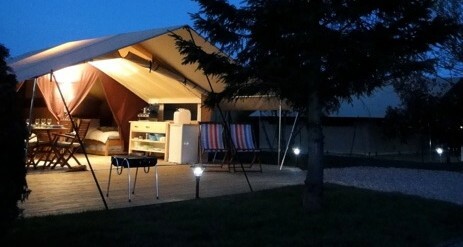 This is more than glamorous camping it’s luxury camping under canvas. Whether you’re a first time camper (or glamper) or simply want to try a different outdoor experience we think you will be right at home in our luxury Safari tent. 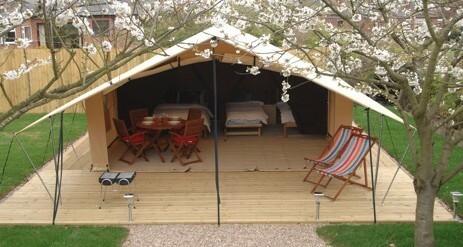 What’s more, the leg work for you as this huge canvas tent is ready pitched, kitted out and ready to go. All you have to do is arrive, relax and enjoy! Relaxed you will definitely be after a blissful night’s sleep. 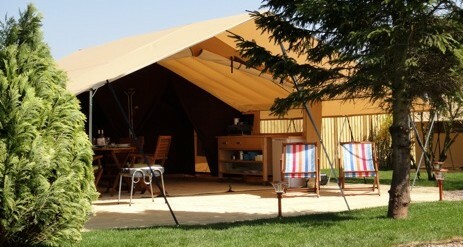 The safari tent offers a few home comforts including proper beds with proper pillows and duvet. Refreshed from your slumbers, you’ll find the tent has all the equipment you need to prepare a feast that will fuel you for a day exploring your surroundings. 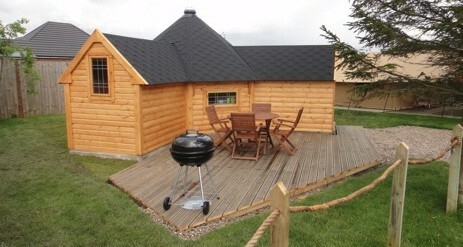 You can enjoy alfresco dining on the decking area under tent’s large canopy. The Safari tent is pitched in the site’s Paddock with its other glamping unit, the brand new and slightly quirky log cabin. Both are within easy reach of the site’s luxury amenity block with under floor heating and auto sensor power showers. It’s cool, it’s quirky and it’s a little bit different but we think potential glampers will love Teversal Club Site’s brand new log cabin. Located in the site’s designated glamping Paddock, this fully insulated rural retreat offers a relaxed camping experience whatever time of year you choose to glamp and whatever the weather. 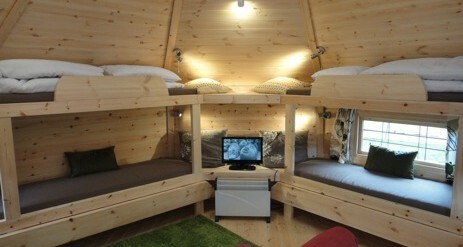 The rustic log cabin will accommodate up to six people but you won’t suffer from cabin fever in here, quite the opposite. Inside the tardis like cabin is surprisingly spacious and well thought out and equipped with a few creature comforts to ensure a comfortable, relaxing break in a cosy and comfortable environment. And because everything is here ready for you, you can immediately relax and enjoy your holiday. Just a stone’s throw from the cabin, Teversal’s luxurious facilities, including auto sensor power showers are at your disposal, further enhancing your glamping experience. WiFi is available at this site. However please note the service is supplied by a different provider to the Camping and Caravanning Club and therefore a Site WiFi card (powered by WiComs) cannot be used. Please contact the site direct for more information. The site shop sells local produce including free-range eggs and bread, as well as newspapers and camping supplies. Farmers’ markets are held at Chesterfield and Mansfield, while Gildages Farm Shop in Heath sells its own fresh meat and meat products. If you can tear yourself away from the campsite, there are numerous attractions close by. The National Trust’s Hardwick Hall and Chatsworth House and Gardens are within easy reach as is Bolsover Castle and Newstead Abbey, the former home of the poet Lord Byron. Water lovers are catered for at the National Watersports Centre which offers white water rafting, wake boarding, water skiing, sailing and more. Families will love Water Meadows Family Fun pool with slides and wave machine situated in Mansfield. Unfortunately the Safari Tent cannot accept dogs.